Other news...PH in Norwich Oct 8 2001. As always check theSofa Sound website. The new album What,Now? is out and is excellent. Best for a while IMHO! Curly's Airship is finally out. Haven't heard it yet, but sounds promising, with most of VdGG and various other worthies. "The Box", a 4 CD set, accompanied by "An Introduction" released 13 Nov. The tracklist is as widely predicted. Its a mix of rare and live stuff and greatest hits from the core albums. The Intro is the very greatest (which is very great indeed). The sound, remixed by Hammill himself, in conference with Jackson, Banton and Evans, is excellent. A nice book of remeniscences and pics is included. Most of the "rare" tracks were already widely available, the majority being BBC Sessions. But the ound is far far better. To celebrate the occasion, I've attempted to produce a definative list of radio and tv sessions (but I bet its still full of mistakes). All in all, therefore, wonderful. When are they producing the next one? May 2000. New studio album "None of the Above" is available. Too becalmed for my taste, I'm afraid. See the Latest Sofa Newsletter for details and order form. A quite nice performance by Peter and Stuart, Recorded Live at House of Blues Harvard Square Cambridge, MA 11.01.99 is available as a web broadcast. Well worth trying! The most recent show was with Stuart on 18th February in Caracas, Venezuela. More touring is promised. Visit the Sofa Sound websiteto get this first hand! In fact the page you're reading is now probably mostly irrelevant. Actually, come to think of it, since Hammill is in the process of putting out official discographies and lyrics on the Sofasite, several of the pages here will probably be discontinued shortly! PH is doing a tour of the US, see Peter Hammill's site! Two new CDs appeared in November, an updated "Fall of the House of Usher", and a simultaneous improvisation with Roger Eno called "The Appointed Hour". See Fie! Records for details. The Usher is a much more convincing production than the original, but cannot transcend the limitations of the concept. The simultaneous improvisations by two musicians who cannot hear each other are about as good as you might expect. 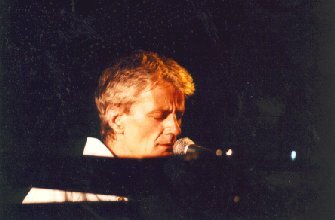 Peter Hammill's own websites went online in late November 1999: Sofa Sound and Peter Hammill.com!